Pixl is a game that tests your brain’s reflexes and memory! It’s simple! 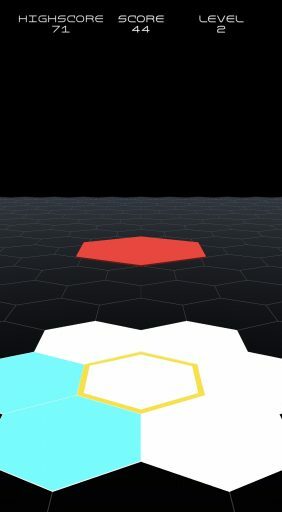 Tap to select a slot and try to fill all available slots with all three red, green, and blue colored hexagon tiles! But be careful! If you put the same colored tile twice in the same slot, you lose! It’s addictive! The more you play, the more you want it! It’s educational! By learning the RGB color model through play! It’s fun! The 1graphics, the colors, the motion! Pixl Game is like an interesting formatted Tetris and Simon in one. Opening the app, I love the home screen. The falling colored pieces are vibrant yet the layout is very simple. To start, tap the question mark in top left for a quick explanation of the rules. Make all tiles white and be careful not to place a color twice in the same slot. That’s it. Hit play, and you are on your way. The first level begins with five empty slots at the bottom of the screen as colored shapes fall into them. As red, green and blue shapes fall, tap a slot for the colored shape to land. When the colored shapes combine, the color will change. One of each color must fall into the same slot to create white. Since the colors are random, you must remember which you have placed and be careful as to not place the same color twice, or the game is over. Change all the slots to white and the level is passed. Moving on, more empty slots are added and the speed at which the shapes fall increases. Fail, and it’s back to level one. Pixl Game is simple in explanation, but has no real tutorial, so it takes a few tries to get the hang of what is expected. Once understood, turning those tiles white is really all there is to it. That being said, I like the game as it is colorful to look at, more difficult as levels progress and yet addicting to play. There is no music during gameplay, which is a bit disappointing as I think it could really benefit from a good soundtrack. The only sound are the tiles dropping and some effects when the level is completed. The app is ad supported, with a small banner at the bottom of the screen, as well as a full screen one that plays in between levels, but it doesn’t hinder gameplay and is hardly noticeable. Pixl Game is an app for anyone who enjoys a colorful challenge. Just know it may mean starting over and over again. The app is available now in the App Store for free. This article Pixl Game iPhone Review appeared first on The Smartphone App Review.